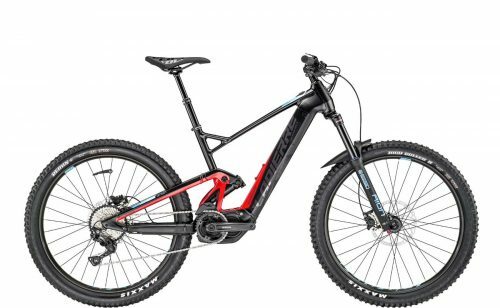 The Overvolt AM 527i is the entry level full suspension eMTB from Lapierre featuring the all new ‘Snake Technology’. Snake Technology is a revolutionary battery solution. 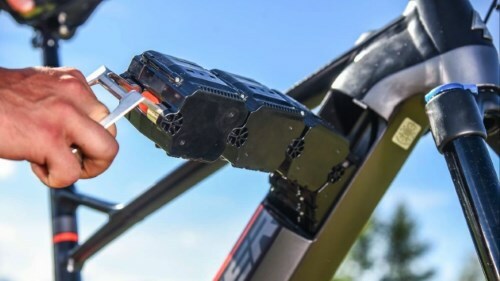 Comprising SIX individually connected blocks, the 500Wh snake battery is around 20 percent smaller than the standard equivalent capacity battery. Furthermore, the frame aperture to remove the battery is 70 percent smaller than standard also. This results in a more rigid frame on the Lapierre, essentially a stiffer, smaller downtube. Flexible yet strong, the Snake Technology battery signals a new era in eMTB. It takes roughly 30 seconds to both remove and site, and is both easy and simple to do. The fit is snug so there’s no rattles or noise! The spec on the Overvolt AM 527i is excellent, even for an entry level model. Shimano’s E8000 70Nm high torque eMTB motor never fails to impress and powers through the most demanding climbs. Designed by Lapierre’s R&D department to combat the toughest of trails, the range of Shimano powered AM range from Lapierre will ensure easy access to all terrain. These fabulous ebikes are huge performers, extremely potent and immense fun. Featuring a RockShox Deluxe R Debonair Trunnion rear shock, attachment is via the lower part of the frame. As a result, the weight is lower down providing greater stability. Very short chainstays ensure precision and speed, with the bottom bracket back as far back as possible. Thanks to a very sensible and precise angle on the head tube, the Suntour AION forks on the front ensure rigidity of the forward triangle and supreme stability. The Overvolt AMi 527i has excellent traction, never rearing up and maintains a high degree of composure at all times. The 150 mm suspension travel is smooth, efficient and reliable. Shimano’s Steps E8000 eMTB system facilitates a very natural ride experience and smooth rider assistance. Shimano components feature heavily on the Overvolt AM 527i. Combining the E8000 eMTB motor, E8000 34T crank set and 170 mm crank arms provides the bike with both dynamic and reactive performance. Integrating the Snake Technology battery in such a clever way ensures the rigidity of the Supreme 5 aluminium frame, resulting in a compact and highly pleasing design for the lower tube. The range of Overvolt AM eMTBs powered by Shimano are truly sensational.